The winter months can be taxing on gutters. The cold, wet and damp can all take their toll if the guttering on your commercial property is poorly-maintained, which is less than ideal during the festive season. To help avoid an expensive (and potentially structural) disaster when you need it least, we’ve put together a guide to help you understand how proper gutter cleaning and gutter maintenance can make sure your commercial property survives the winter. What are your gutters telling you? As we all know, winter follows autumn – and the autumn leaves can wreak havoc on guttering. If leaves are left to sit in your gutters and around your property, they can begin to decompose – making a haven for bacteria – which can cause chaos on your property. Moreover, these leaves can cause blockages in both gutters and downpipes, which can lead to damp and rot forming within the property. Damp can be detrimental to the health of your workforce, which will subsequently impact productivity. Clearing the gutters and drains on your commercial property can help minimise the risk of these problems arising, making proper gutter maintenance a necessity to prevent further expense to your business. How do your gutters look this winter? For gutters to fulfil their duties, they must be clear of any obstructions – which is where proper gutter cleaning and gutter maintenance can help. The autumn leaves can be a real nuisance for gutters. Not only can the decomposing materials cause damp, but they can also cause blockages in downpipes. These blockages can lead to standing water accumulating, which can be lethal if the temperature plummets and the water freezes. 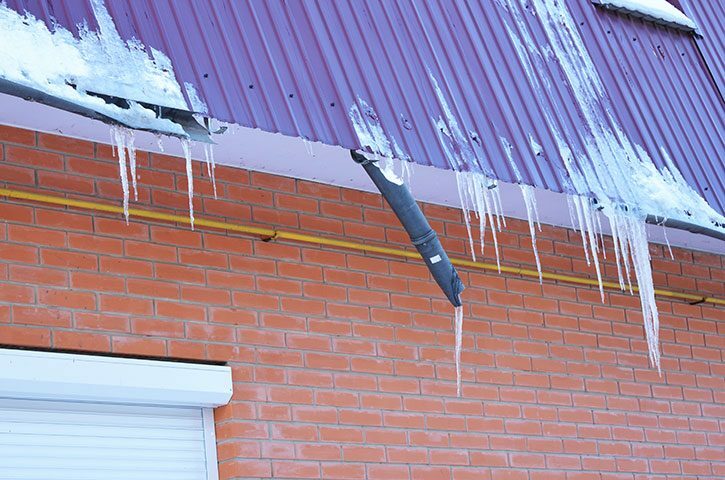 As ice expands, it is likely that gutters and pipes will crack or split – which is a clear giveaway that they are in need of some gutter maintenance. You can get the best idea that something is amiss by looking at your gutters – if they seem to be overflowing down the walls of your property, then there is probably a blockage. Similarly, make sure that your downpipes are diverting water away from your property – which will help to prevent further damage during the winter. If you can see any obvious problems with your gutters, don’t let them get any worse. Forming a relationship with a gutter maintenance company that you can trust could be your saving grace if disaster strikes this winter. Moreover, by contacting the professionals (as opposed to trying to fix the problems yourself), you can minimise the chance of causing further damage. Gutter cleaning professionals are well-equipped to deal with any problem that your gutters can throw at them, as well as knowing all warning signs to look out for that you may have missed. Introducing a gutter maintenance company into your facilities management strategy can also help install preventative measures. By getting your gutters cleaned regularly, the problems will stop in their tracks. To avoid disaster, aim to have your gutters cleaned regularly (especially once the autumn leaves have stopped falling), to allow your gutters to divert water away from your property effectively. Regular gutter maintenance will help prevent little issues turning into huge problems – giving you the ultimate peace of mind should the weather turn. If you don’t currently have a relationship with a gutter cleaning team that you can trust, give one of our friendly team members a call on 0800 046 1376, or email us at info@ukgutters.co.uk and we’ll see what we can do – these problems can’t wait!